I honestly can’t recall why I initially wanted to make this recipe, but I am so glad I did. Maybe it was inspired by a menu, or a discussion of what we wanted to eat (garlicy seafood). So no entertaining anecdote, but this stew works equally well as a belly-warmer in the winter or a light meal in the summer. 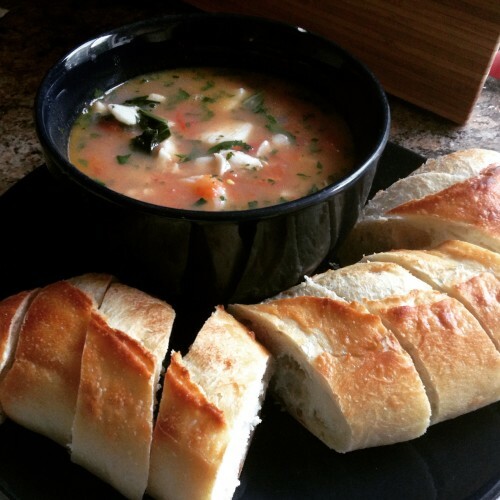 The recipe I initially used is from Food52 and it might have been inspired by a cioppino, but it’s much simpler. 1 c. clam juice* (or seafood stock, or homemade fish stock) *Note: If you’re purchasing seafood stock or clam juice, there is a specific can of clam juice—do not use the salt water that canned clams are packed in. The first steps of the recipe can be done a day ahead, or just earlier in the day, and then reheated before adding seafood. Heat the oil in a large sauce pan, add the garlic and saute on very low heat, for about two minutes or until the garlic is fragrant but not browned. Add the sliced tomatoes, clam juice, white wine. Simmer for about 10 minutes. Set aside until you’re ready to serve dinner, then complete the final steps. If set aside, bring broth mixture back up to heat. Add the seafood (white fish, scallops, prawns) and simmer for about 5 minutes until seafood is just cooked. Don’t overcook as even once it’s removed from direct heat, it will still continue to cook. Stir in the fresh herbs (parsley and basil) and serve immediately with warm, crusty bread. We’ve also used a mixture of fresh fish and frozen (thawed) prawns and it works fine either way. I also like to cut the prawns in half, and halve the scallops if they’re particularly large, but that’s mainly for ease of eating—you want spoon-sized portions.